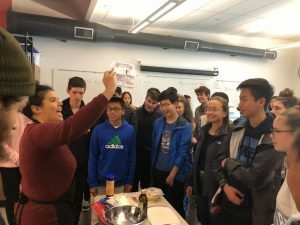 This past month, The Cooking Project had the opportunity to work with Natalie Muñoz in teaching students at Lowell High School how to make Empanadas with Sweet Plantain and Queso. We discussed Food and the Community by highlighting how plantains are a staple which has nourished West African and Caribbean communities for centuries. Natalie attended Stony Brook University where she completed a Masters of Social Work and Bachelors in Psychology from Stony Brook University in New York. She was recently accepted into Howard University’s Ph.D program in Social Work and Psychology where she hopes to study the impacts of racial trauma via social media on students of color in the Trump era. In the future, Natalie looks forward to opening up her own psychotherapy practice and teaching at the college level. Natalie is a 2nd generation Latina raised in Queens, New York, and her family is of Dominican and Cuban descent. In her spare time she loves hiking, yoga, meditation, cooking, cycling, and dancing salsa/bachata. 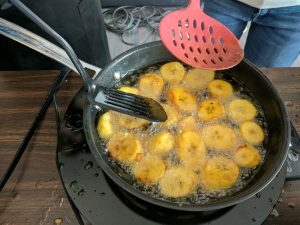 Fry slivers of plantain in cooking oil at medium-high heat in a large frying pan. Flip plantain so it is cooked on both sides, and once it reaches a very light brown color on the edges, remove them from the pan. Peel the empanada wrappers/discs so you have one disc/wrapper on a clean and flat surface. Place 2-3 slivers of cooked plantain in the middle of the disc. Drizzle about 1 TB of cheese on top of the plantain. Fold the disc in half and press a bit around, so the cheese is sealed and it does not melt out. Use the tip of a fork to press on the edges of the disc to make sure it is sealed. 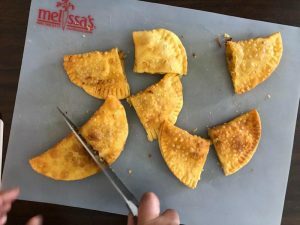 Fry the raw half-disc empanada on both sides until they are slightly brown, without letting them burn (just enough to melt the cheese inside and make the wrapper crispy). Drain on paper towels, let cool for about 2-3 minutes, and enjoy! Throughout the class, Natalie brought up the theme of identity, and how we can connect ourselves and our culture/identities to food and the process of cooking. 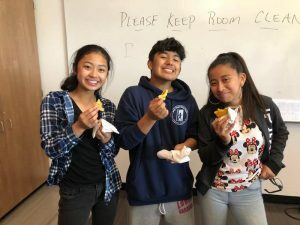 For some, food is an integral part of their cultural identity, as food is so closely tied to the surrounding area and what is available to them. In Natalie and her family’s case, plantains grow vastly in the Dominican Republic and Cuba where her family is from because it is a quick and easy snack and the staple of most meals because it is highly accessible, easy to make (usually boiled), and high in energy food that’s easily absorbed in your body – a super energy-dense food for those working the in fields. The ingredients used in familial and traditional dishes have strong ties to the history of a culture, and is used as a way to bring families and friends together in the shared activity of cooking.